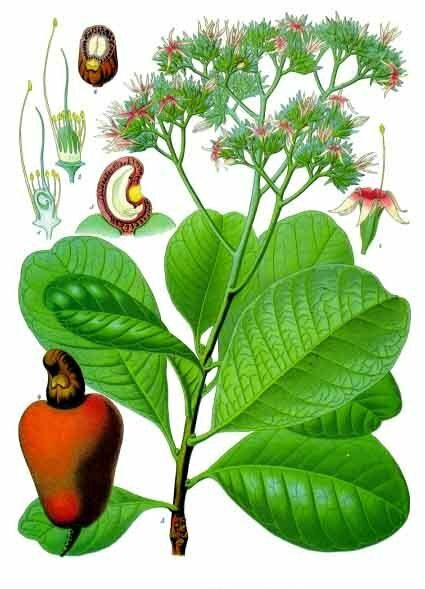 This media item is originally from http://commons.wikimedia.org/wiki/File:Anacardium_occidentale_-_Köhler–s_Medizinal-Pflanzen-010.jpg, last uploaded by Editor at Large; it was copied to a local repository as a caching mechanism to speed up page rendering and to prevent links to break when media items are renamed on commons. For a full list of earlier authors and contributors please refer to the file version history and the metadata version history in the repository from which this media item has been copied. Deutsch: Kaschu. A Blühende Pflanze. 1 Blüte vergrössert ; 2 Stempel und Staubgefässe; 3 Dasselbe im Längsschnitt; 4 Frucht mit dem vergrösserten und reifen Fruchtstiel; 5 Frucht im Längsschnitt; 6 Frucht im Querschnitt. Русский: Кешью. A — цветущее растение; 1 — цветок; 2 — пестик и тычинки; 3 — то же в продольном разрезе; 4 — плод (орех) с разросшейся и спелой плодоножкой; 5 — плод в продольном разрезе; 6 — плод в поперечном разрезе.